Huang Wei works at the Shanghai Crafts and Arts Factory to restore and repair antiques and artworks. Putting on a white coat and mask, and taking up a knife, the “doctor” — Huang Wei — starts work. However, what Huang treats are not patients but damaged cultural relics made of porcelain, metal, ivory, wood or bamboo which were smashed to pieces or blemished by stains. “The restoration work requires great concentration and precision,” the 32-year-old repairman says as he works on a broken pottery Ding (a cooking vessel) that is around 1,800 years old. Huang has pieced it together, and the next step is to color the places where it is glued. “It must look the same with its original color, and what’s more important, I need to revive the mottled, coarse texture as it was hundreds of years ago,” he says. Huang has his own method. He merges and adjusts the colors to what he wants, dips in the tip of a small paint brush, and carefully flicks the pigment onto the vessel’s surface, creating the variegated, rough texture. Huang was one of the initial 15 graduates of China's first undergraduate-level school for the preservation and restoration of cultural relics at the Shanghai Institute of Visual Arts based in Songjiang. After graduation, he started work at the Shanghai Crafts and Arts Factory to restore and repair antiques and artworks. "Ironically, only two of the 15 graduates are engaged in the industry now," he says. "Few people can stay because restoration work is boring with fewer job opportunities. In addition, it's not good for health because we are exposed to various chemicals everyday." Over the past five years, Huang has restored about 400 cultural relics, including porcelain and bamboo items, bronzeware, ivory pieces, wood carvings, ostrich eggs, dinosaur egg fossils and many others. The sculpture, 70 centimeters tall and rather heavy, demanded high skills and a detailed restoration plan. After preliminary work, which included taking measurements and photographs. Huang started several trial runs in putting the pieces together in the right way. Separated pieces were bonded with "bridge nails" driven inside, an ancient Chinese technique. The main body was polished, colored and glazed to look old. Each step required time and absolute attention. When coloring the piece, Huang used brushes of different sizes and various mineral pigments. The colors were added shade by shade, layer by layer, until they were integrated with the original colors. Propylene pigments were chosen to create a matte, semi-dull effect, while other places were polished to make them glossy. "After the restoration, it was hard to tell the sculpture was once broken to pieces," Huang recalls. There are different principles for different restoration purposes — archeological study, museum exhibition and commodity trading. For art piece transactions, items need to be restored to perfection, which will greatly increase their value in the auction market. But, reversibility is the golden rule. "Reversible restoration causes minimum or even no damage to antiques and artworks, and this should be the first thing to remember always," Huang says. 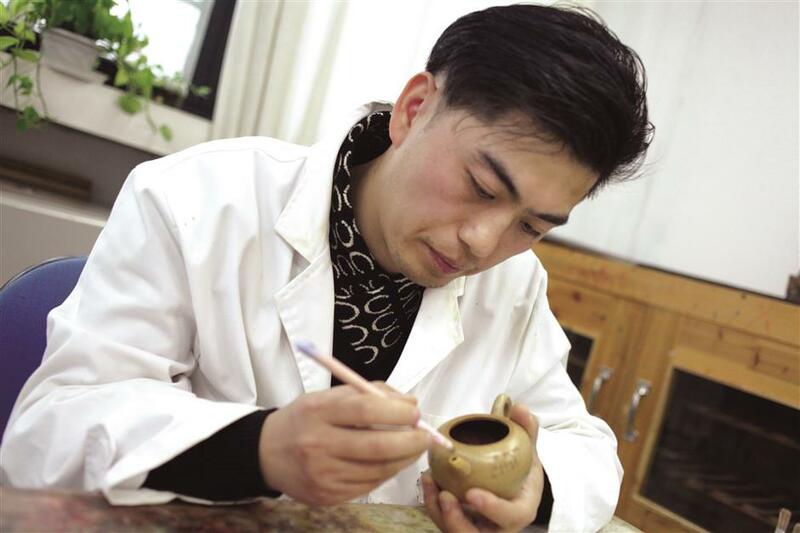 Last March, he restored a clay bowl from the Han Dynasty (202BC-220AD). Clay, which easily absorbs water, is not as tough as pottery, so there were lots of things to take into consideration when sticking the pieces together. Tests were conducted to see which adhesive (emulsion or water soluble) was the best. On one hand, it needed to have good adhesive strength; on the other, its hardness after solidifying should be lower than that of clay, to guarantee chemicals would not damage the antique. After trial and error, Huang found the way. He used a water soluble adhesive first, then changed to emulsion glue. "Sometimes we need to be flexible when confronted with difficulties. I'm always telling myself there might be better solutions out there," he says. His clients vary from rich people, collectors and artists to experts. But Huang has rules when taking orders — he never restores fake items. "It's my professional ethics and personal integrity that I must hold fast to," he says. Huang has dealt with unreasonable clients on occasion. Once, an auction house boss asked him to restore a dragon-pattern large porcelain vat from the Xuande period (1426-1435), priced at 16 million yuan (US$2.5 million). The boss required him to finish the work within a month because it was going to be auctioned. "I flatly rejected him because it would take me at least one year to restore. It's work that needs time," he says. Even a tiny crack would normally take a month. "There are no shortcuts," he says. Huang never stops learning. After work, he reads extensively and studies oil painting restoration skills as well as artwork authentication. At weekends, he ventures to museums, auction houses and art galleries. "Each time when I restore an artwork from a pile of fragments, I feel a sense of achievement," Huang says. "And it's also my duty to carry forward the restoration techniques to young people. I hope more people can join us and preserve our splendid culture."